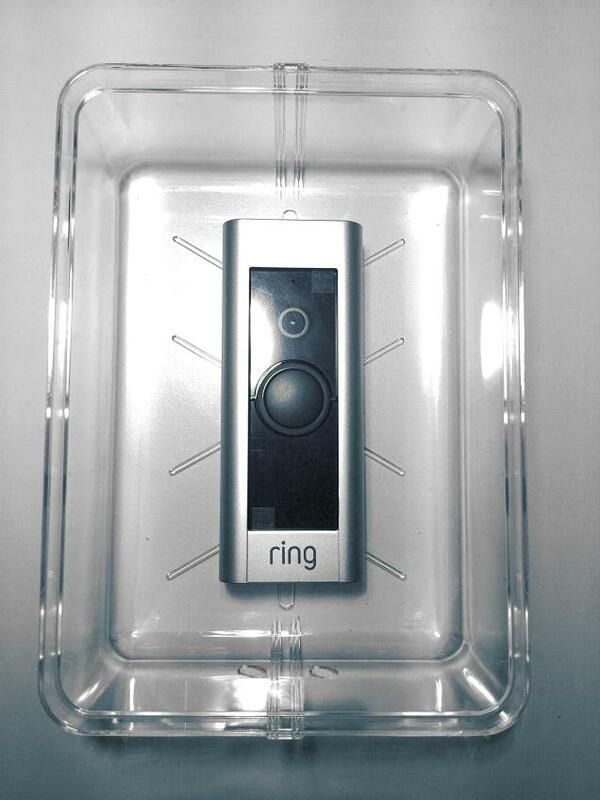 Application: Item# 88004 RING PRO® Wireless Doorbell Box® has two additional holes on the bottom close together to allow access to the security screw and charging port on the bottom of your RING PRO® Video Doorbell. The "Security Screw" requires a special screw driver that is provided with your Video Doorbell. Installation: A clear plastic cover (not pictured) is included with your Doorbell Box® which should NOT be used when you install your Doorbell Box®. Leave the front open to allow the motion sensor to work, and to allow access to the doorbell button. Use the clear cover only to provide extra storm protection of your Video Doorbell when extreme storms with driving rain or blizzard conditions are forecast. The cover will withstand even hurricane winds. Secure the cover with painter's masking tape during the storm. Remove the cover after the storm. Easy to Install: The Doorbell Box® allows you to easily mount your Video Doorbell to clapboard siding or any other uneven surface inside this attractive clear plastic protective housing that will not discolor. The sturdy Doorbell Box® comes with pre-drilled holes for easy mounting of the Ring Pro® Video Doorbell and can also be modified for the SkyBell® Wi-Fi Doorbell, Zmodo®, VTech® and others. Theft Resistant: Once installed inside the Doorbell Box®, your Video Doorbell is less likely to be stolen. Although it is unlikely vandals will attempt to steal your video doorbell, once installed inside the Doorbell Box®​, the RING doorbell is more difficult to remove. Item# 88004 allows use of the security screw on the bottom of your doorbell and proprietary screw driver for added theft resistance. Protect Your Investment: The Doorbell Box® helps to protect your video doorbell from rain, ice storms, blizzard snow storms, high humidity and other adverse weather conditions. Temporary use of the cover will protect it even through a hurricane. Although weather-resistant, these video doorbell devices are not water proof or moisture proof. Unless you live in a sunny climate where it never snows, never rains and there is no humidity, moisture will collect behind it, and your video doorbell will eventually fail.